The solemnity of the holy Apostles Peter and Paul. Simon, John’s son and Andrew’s brother, was the first among the disciples to confess the Christ, the Son of the living God, by whom he was called Peter. Paul, the Apostle to the gentiles, preached Christ crucified to Jews and Greeks. Both, out of love for and faith in Jesus Christ, announced the gospel in the city of Rome and died as martyrs under the emperor Nero. The first, according to tradition, was fastened to a cross upside down and buried in the Vatican along the via Triumphali, while the other faced a sword and was buried along the via Ostiensi. Today the whole world celebrates their triumph with equal honor and veneration. In Samaria or Sabaste in Palestine, the commemoration of Saint Elisha who, a disciple of Elijah, was a prophet in Israel from the time of King Joram to the days of Joash; although he did not leave behind any oracles, nonetheless, by working miracles for those in need he announced the coming salvation to all men. The commemoration of Saint Amos, prophet, a herdsman of Tekoa and a dresser of sycamores whom the Lord sent to the sons of Israel, that he might vindicate the Lord’s justice and holiness against their lies. These liturgical commemorations keep reminding me that we do not read the biblical authors as long-dead but as members of that “cloud of witnesses” cheering us on. 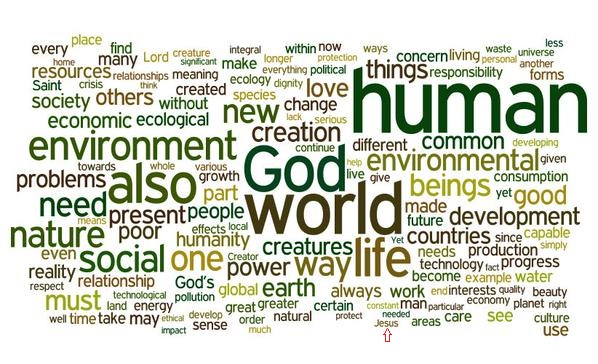 They add this little note: “Word Cloud of the Encyclical: Not exactly, “He must increase, but I must decrease” (Jn 3:30)” The biggest word in the whole cloud is “human”–and notice the little arrow they put in, pointing to the tiny word “Jesus”? Cute! Shoot. 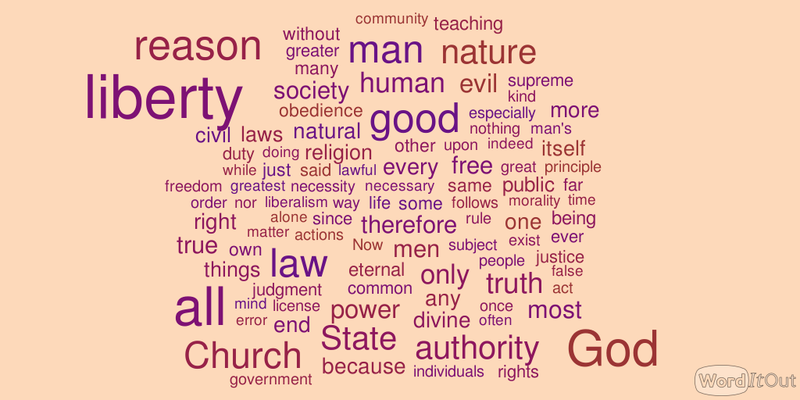 The biggest word is “liberty”–and Jesus doesn’t even appear in the cloud! 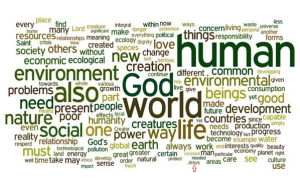 And did you notice that “reason” has huge letters, while “faith” is nowhere to be seen? 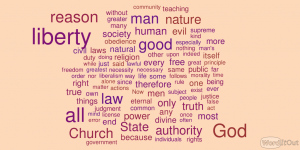 Now that we know the secret to judging magisterial documents, we may need to re-write the history of doctrine…. The memorial of Saint Barnabas, Apostle, who, being a good man and full of the Holy Spirit and of faith, and numbered among the first believers in Jerusalem, preached the gospel at Antioch and introduced the newly converted Paul of Tarsus into the number of the brothers and accompanied him on his first journey to evangelize Asia Minor; later, he was present at the Council of Jerusalem and, having returned to his fatherland, the island of Cyprus, he spread the Gospel.